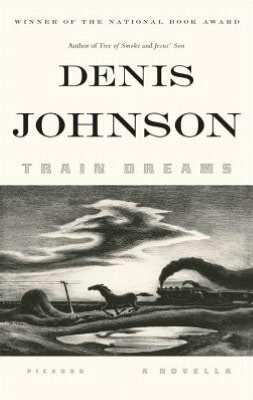 Writing a big story in a small book, Denis Johnson tells a strange history of the American West through a man’s life on the railroad in his 116 page novella – Train Dreams. Johnson demands your attention by beginning with a Chinese laborer dangling from a rail trestle, but then backs off into a drawling account of Robert Lanier’s life from his young orphaned years in the late 1800s to his death alone in a cabin in the woods eighty years later. As Johnson follows Lanier’s life in the Idaho panhandle, the story takes on the flavor of a yarn told around the campfire – until Johnson jolts the narrative. When Lanier is not witnessing death, he tells of rail accidents, fires, murder, and catastrophes, but in a disaffected tone that makes the incidents seem like normal fare for the times – sometimes with a sense of justice. The tale of the dog-shot man is at once humorous and jarring. Pioneer characters sprinkle the narrative at first, and later Johnson has Lanier spotting Elvis Presley on a train. This entry was posted in American history, authors, book review, books, history, reading and tagged birth of the railroad, Denis Johnson, evolution of the West, Idaho, Idaho Panhandle, Johnson, Rail transport, railroaders, Spokane, Train Dreams, United States, Western United States. Bookmark the permalink.